Pediatric Hearing - Hearing Evaluation Services of Buffalo, Inc. 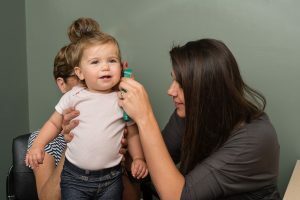 The ability to hear is fully developed shortly after birth; however, it is a long time before sounds will develop meaning to your child, and even longer before your child can respond to speech and sound in meaningful ways. The following guidelines for development can give you some idea if your child is hearing normally. Remember that all children develop at a different rate; however, if your child does not seem to be hearing normally it is important to have their hearing tested right away. If your child does have a hearing loss, early intervention is the most important step to avoiding speech, language, and developmental delays! In the first few months of life, an infant should respond to sound by waking, startling, or crying in response to loud sounds. Also, infants may appear to pay attention to voices and may be soothed by the sound of your voice. By this age, babies have the control to turn their eyes in an attempt to locate sounds. Your child should also stop and listen to voices and may smile when spoken to. Your child may enjoy toys that make interesting sounds, such as rattles. Children at six months of age are able to turn their head in an attempt to locate sounds. They should begin to respond to the sound of their name, and begin to respond to the word, “no,” or other changes in the tone of your voice. By this age, children are babbling and producing a variety of speech-like sounds. At one year of age, children can recognize common words and understand simple requests (e.g., “Look at Daddy!”). They can imitate and repeat speech sounds and may begin trying to say their first words. By one and a half years of age, children should have around 50 words in their vocabulary. They should respond to simple commands (e.g. “Give me the ball.”), and should point and vocalize to communicate about things going on around them. At this age, children should have a large vocabulary of 200 words or more. When speaking, they should put together two or more words at a time. Your child should be able to point to pictures in a book and identify or point to body parts. Children begin to use language in more complex ways at this age. They should be able to participate in short conversations, and will begin to add endings, such as –ing or –ed, to words.